first minute when Shimon picks us up at Lev Hamifratz until the last minute when it is time to say: “until next time!”. 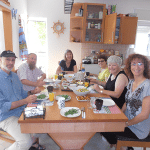 The joy and laughter in the house, the hospitality and warmly, the beauty of the garden and fields, the delicious breakfast , Idan’s piano music at night – all of this is unforgtable. And it is no wonder that we learn more thou we could ever imagine, even just in five days, in such a wondrful Home Ulpan rettius. Shlomit is such an excellent teacher who knows exactly where we are and what we need to do to improve. It is amazing how much one can learn in just a sort time with such a teacher. Deep, deep thanks to all of you, and I am already waiting for my next time to return – even though I have not even left yet!